I'm going to go ahead and make a confession...I am such a freak! Not in a bad way mind you, but in a bizarre sort of way. 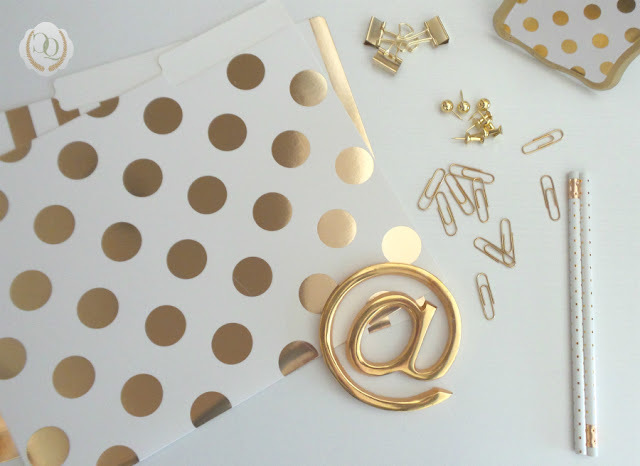 For instance, I found these cute gold and white file folders a while back. I've really been attracted to all things gold lately. The hubster's sweating...he wants to make sure the gold attraction doesn't turn to the jewelry department. Even though I don't have anything special to put in them, I just love these gold and white folders. They make my work seem so much less tedious. Unfortunately, in order for me to use the folders, I needed to find some coordinating supplies....see, freak of the week. While out prowling shopping around one day, I came across these little beauties! I was ecstatic! I actually squealed a little when I found them. Most of these items were found at HomeGoods in a packaged set. The sweet little pencils, the frame and the @ sign were found at Hobby Lobby. I cannot wait to get these things all set up in our home office. I have a gold stapler and gold-handled pair of scissors....somewhere....in storage....packed away. 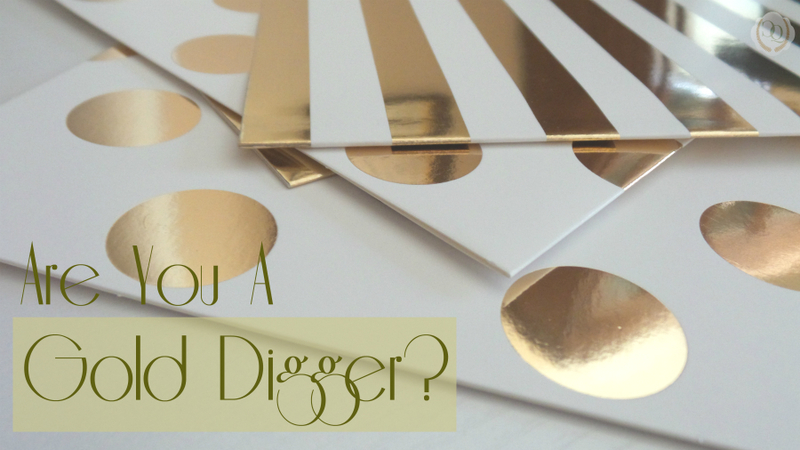 Please tell me I'm not the only one out there who's a gold digger! 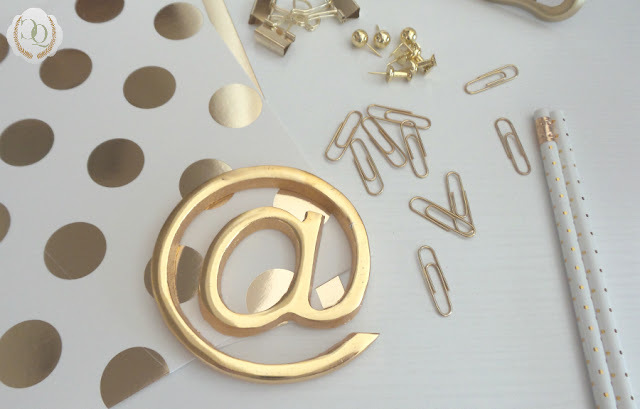 I love gold too and didn't even know you could get it in office supplies! I am from the north and I definitely know what a conniption fit is. I have them a lot, especially when someone else messes up my stuff! I was so excited when I started seeing gold office supplies at different stores. I've been buying a few things here and there when I see them! LOL @ messing with your stuff...I totally get that!! Love and hugs to you! All of those gold accessories will most definitely make work more palatable! And if the obsession spills over into jewelry, just remind your hubby that you were a real catch ;) Hugs, my friend. See, I'm the same way about gift wrap..I want it all to match. I used some gold gift wrap at Christmas...well then, the ribbon and tags had to match, then the napkins had to match all of that, then the glasses, plates, forks, spoons, knives and serving pieces had to match all of that...LOL Honey, I tell him that all the time! LOL Good thing he agrees with me! Love and hugs and thank you so much Julie! Gold on my desk always helps me suffer through the work I have to do. I'm so glad there are so many cute coordinating gold items to choose from now and I couldn't agree with you more...they should all play well together!! Saw a few more things at HomeGoods that I may have to grab for the desk. Hmmm, if I keep buying things for the desk, there will be no room to work...I like the direction this is going! :-) Love and hugs to you!! Still hanging in there! I am the same way. I cannot work unless things are tidy. I like to have fun pretty items for my office as well. I like the gold! You have inspired me to possibly go gold for when I change up my office space. At this time I have flowers. I think fun, pretty items are a great motivator to complete a task that we are not really interested in completing…I know it is for me! 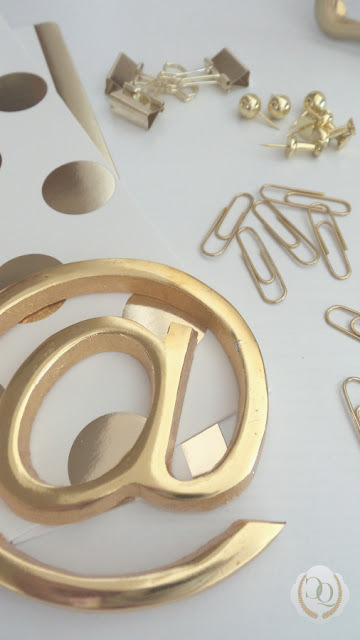 I’m so glad I was able to find some cute gold things…they go great with my white desk and a few of the wood pieces I have. I will be so glad to get this all pulled back together. Thanks so much Carla! Love and hugs! Gold is good Benita. I think you have some very pretty stuff for your new office. I am very organized too and need everything in it's place too. I bet you will be so excited to get into the new house soon. Thank you so much Kris! Since an office is where we seem to spend most of our time, I think it should be pretty and organized! I'm am so ready for a home...unpacking it all will be like Christmas! Love and hugs to you!! Thank you so much! I’m ready to get it decorated and hope we get to move before too long! I’m so glad everyone knows what a “conniption” is…sometimes when I say that word people look at me like I’ve lost my mind. And it is definitely something that only women have…LOL Love and hugs!! Target has some of the best gold goodies out there. I found most of mine at Target, HomeGoods and a few things at Hobby Lobby. I have been thrilled! And I don't blame you one bit if you leave the drawer open. Organizing a junk drawer is a big thing and once it is in shape, it is something to be admired! I did mine in the TN house and I was pretty darn pleased with myself...LOL Love and hugs!! Oh...fyi...conniption fit is a term we use all the time up here!! I may not be a gold digger, but I am an office store junkie and love to buy all those matching office supply goodies. For the past year, PEACH has been in everywhere, and I've bought folders, journals, push pins, magnets, notebooks, notepads, paper clips, etc... for my sister who loves peach. Her office desk is a beauty to behold. 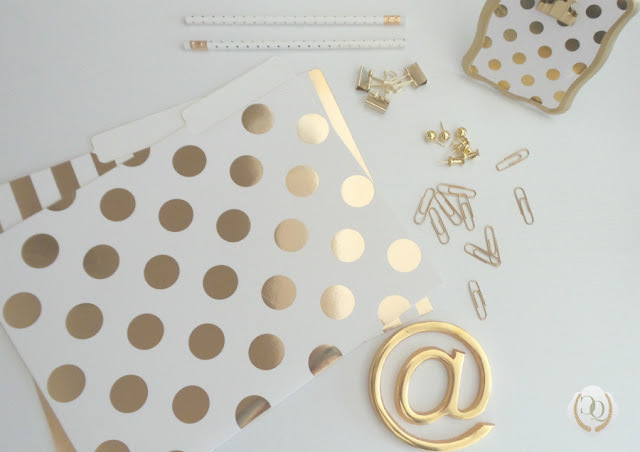 I like shopping for pretty office supplies about as much as I like shopping for other pretty things for the house...it just makes everything look so much nicer! Oh, I bet that peach is gorgeous!! And I think it is wonderful that office supplies are offered in so many different colors now...definitely makes it alot more interesting! Love and hugs!! I almost put a YouTube video of this song…edited of course, but then changed my mind. It’s pretty rough even edited…LOL. When I worked at the law firm, I would have all of that stuff on my desk, especially the papers, also and for some reason, never bothered to find pretty things to sit on it. If I ever have to go back to the corporate world, you better believe that desk is going to look very differently! :-) Love and hugs!! I love them! 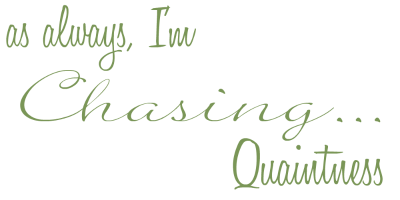 Thanks for popping in to visit my blog! Hope to see you again. Thanks so much Penny! And you are quite welcome...love those tulips you have sitting out! Just beautiful! Thank you for visiting and I hope you will visit again! Have a great one! These are really cute. i can see how this would make working a whole lot more fun. Hugs! Thank you so much! It may not inspire me to work, but it sure makes me feel better while I’m sitting at the desk! :-) Love and hugs! Great to be colour co-ordinated too! The gold does look good. Thanks so much! I really do love gold things right now...just trying to keep it under control! :-) Hope you are having a great week Jan! Love and hugs! When I read your question about left or right brain being the organizer, I popped right into "teaching" mod. I actually got certified in "Brain Dominance" by the Herrman Institute way back in my days of being a Training Program Manager. Right brain is anti-organization, Left brain loves organization. A person can use any part of the brain (they divide into 4 quadrants...top right (imagination) bottom right (all heart) top left (financial) bottom left (order) loosely said here for brevity) just like you can use either foot or either hand, but like right-handed people prefer the right and left-handed prefer left, when stressed you will use the part of the brain you're dominant in. This lesson has been brought to you by my obsessive teacher personality! LOL. I LOVE, LOVE, LOVE that you shared of this…see, now my mind is clearer just having the information at my fingertips! I am clearly all LEFT brain…as I have no imagination, but am all about keeping order and finances straight! You are too funny and again, thank you for this info….I could just never remember!! Love and hugs to you!! Can't wait to see what you do with the office! It's a great song but definitely has to be edited...Kanye is a bit offensive at times...LOL (putting it mildly). Yeah, I like the coordination of things and not so much that everything "matches". Me either girl....right now, it sits in the middle of my MIL's dining room...LOL Love and hugs to you!! I can understand your excitement about the supplies. Turn me loose in a stationary shop and it's like a candy store for me. That doesn't mean I'm lucky enough to be organized like you, my sister Deb got all of that particular gene. And my daughter is a close second. But fun? Oh yeah. It's great, isn't it?!! I can remember when office supplies and organization supplies were so boring and uninspiring! I'm glad there are so many things out there to make it all look pretty and still be functional! Love and hugs to you sweet friend!! I’m with you on that one Amalia…I want it now…LOL. I love the pink and gold also and have tried to resist picking up the cute pink/gold things I’ve been seeing in HomeGoods…but I may have to pick one or two just to throw in! Love and hugs! !